UPDATE: We already have a winner. Mr. Dustin Hoffman has defeated the odds and got this on his first guess. Please email me your info and I’ll get the prize in the mail. I’ve removed his answers just in case someone was real bored and needed a challenge. I’ll get around to posting the answers in a couple of days or weeks, or hell, whenever I get to it. I really hope it’s the real deal Dustin Hoffman, I’m a big fan of the Ishtar! I’m bored! So I put together a little puzzle. 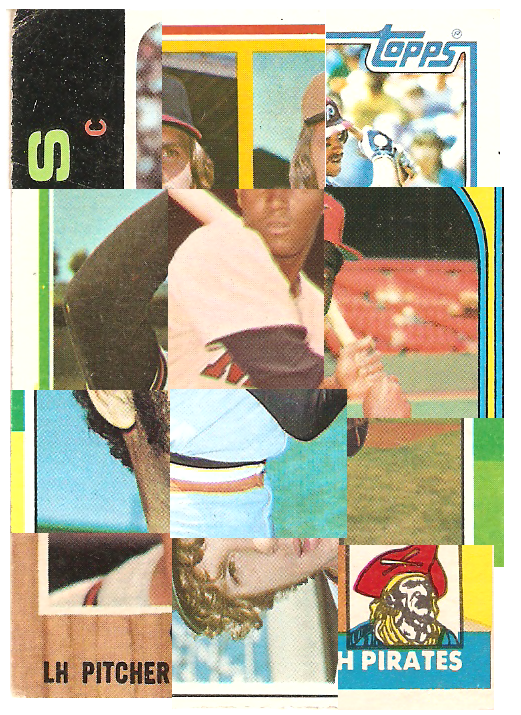 Above are 12 different baseball cards all mish mashed into one card. All you have to do is figure out what all 12 cards are. 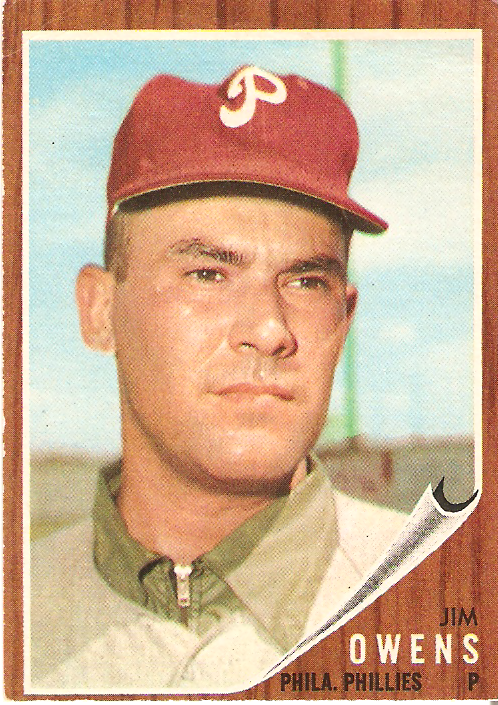 I need the year and player or number of the card. The winner will win all 12 cards featured in the puzzle. The first to answer 100% correctly in the comments section wins. It’s as easy as that! If no one answers correctly with in a few days I will slowly reveal clues through my Twitter account. Some jump out as pretty easy, but a few of them may take a while. Guess as many times as you wish. The only hint I will give here is their high Beckett value. These are in no particular order. That is a grand total of $201.80 worth of cards! Actually that’s the total Hi-Beckett, so really it’s about $20 or so, but they’re some great cards in there! Good Luck! Yesterday I received a package from Tom. He is the New Members Coordinator at the OBC. He also has an amazing page or two with comparisons of all the ’62 green tints side by side. A must see for anyone who is trying to complete those! The OBC is an online trading community where they emphasize the importance of the community over book value and condition. I’m currently trying to become a member and I have no doubt I will make it once I complete a few more trades. Many of these guys will take a look at your wantlists and be more than happy to send you cards with nothing expected in return. Their main interest is anything vintage, and since I swore off anything new this year, I decided it would be a good fit for me. I’m having trouble making vintage trades within the blogosphere because it seems so many of the bloggers are concentrated on everything new. Even some of the ones who do collect vintage are sticklers for condition, which I don’t feel comfortable dealing with. I don’t want to send what I think is a great card in a trade only to find out they are less impressed with the condition it was in. Now I have found a few who are not, and have had great trades with them, but the problem there is once you make the trade, it’s hard to match up more trades without waiting for a while. 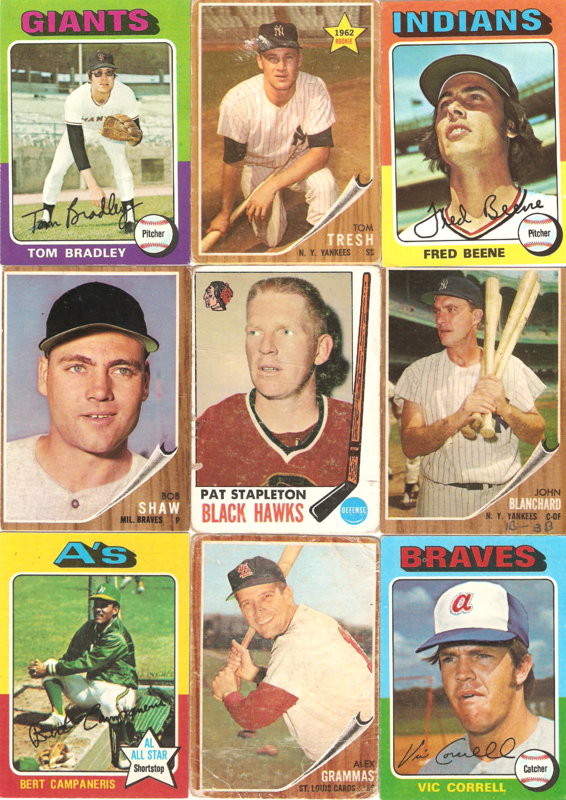 It’s just not as easy to build a vintage pile of trade bait as it is with the modern stuff. I have decided to try to join a few online trading communities because I don’t have a shop nearby, I’ve bought all the ’62’s from the dealers at the local show, and the blogosphere seems to not have many ’62’s for trade. My first attempt is with the OBC. It has gone pretty good so far. I have sent off two packages and received one back. I have the feeling I’m going to get something back for the other one too, even though it was not necessary. The only bump in the road is the same one I’ve had with other online through the mail trades. People just don’t seem urgent to get back to you once you offer them cards. I have three emails sent waiting in limbo right now through the OBC, and I have two trades through the blogosphere that are hanging there also. I would complain more but I am just as guilty when it comes to this kind of stuff. Sometimes I completely forget trades until I get a reminder email asking if I’m still interested. So I guess I wait and see. On with the goods. Tom sent me a nice sized pile of 1962 and 1975 Topps. He also sent me one of the ’69-’70 Topps Hockey cards I still need. I scanned the Jim Owens card above because it reminded me of my old driver’s ed. teacher. Not because he looks like him or anything but his name was Jim Owens. I actually was his teacher’s assistant because his free hour was right after lunch which gave me a two-hour break in the middle of the day. That, and he’d let me take the driver’s ed. car out for lunch just as long as I would bring him back a blizzard from DQ. Mind you that I was still in driver’s ed. and did not have a license. He always told me that I’d never get pulled over in a car with huge student driver sticker on the sides. He was right, it never happened! If anybody’s out there who wants to make a vintage trade hit me up! I also owe Tom a big thanks for the trade and for the help with the OBC! A little brown-nosing never hurt no one, right? 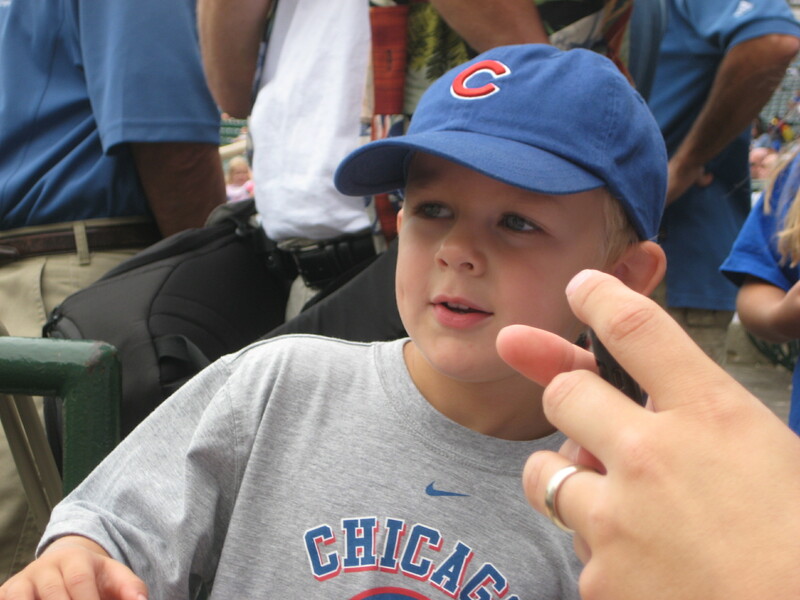 Today was my son’s first experience inside Wrigley Field, and what an experience it was. Yeah, that’s him down on the field! He’s managed to do something at his first game that I have yet been able to finagle, go on the field! 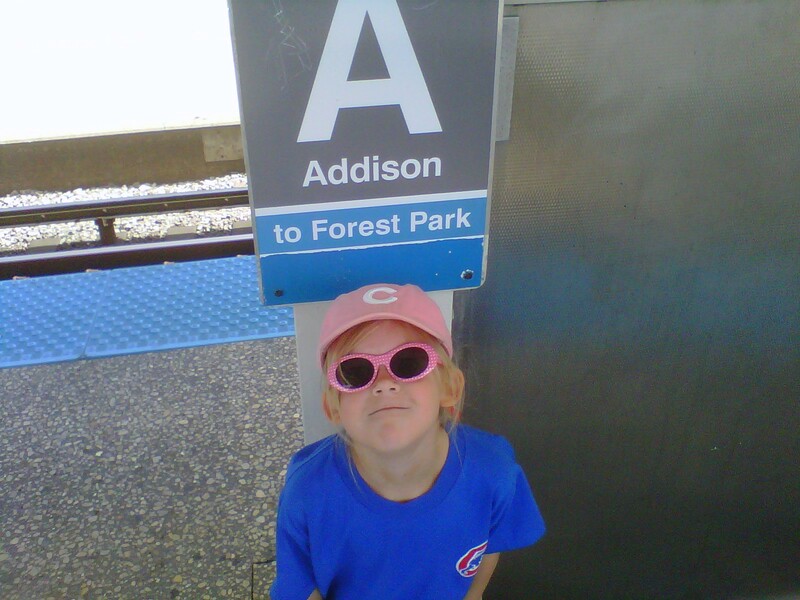 That’s my daughter behind him in the pink hat, it took her a whole two times to accomplish this feat. 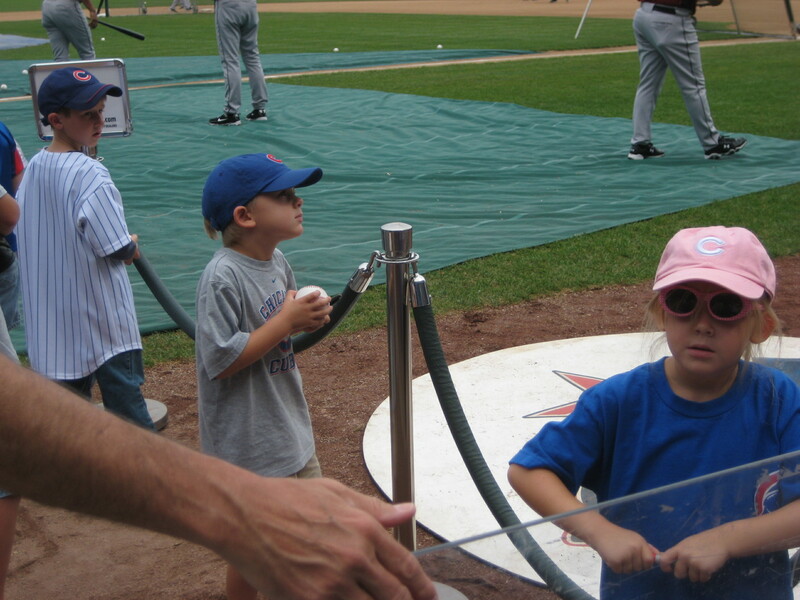 Apparently if you have really good tickets or go to some desk somewhere and get a sticker, your kids can go on the field in a little roped off section to get autographs. Luckily I managed to get a hold of some good tickets. No parents though. I was crushed! So I did what all the other parents did, stand behind the wall and yell directions at the kids! 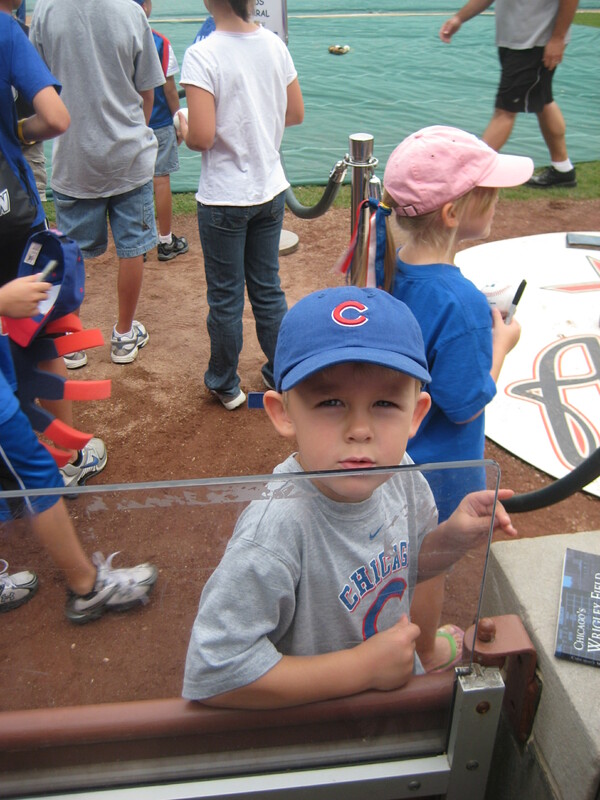 Unfortunately the Cubs had just finished up BP and were for the most part headed for the clubhouse. 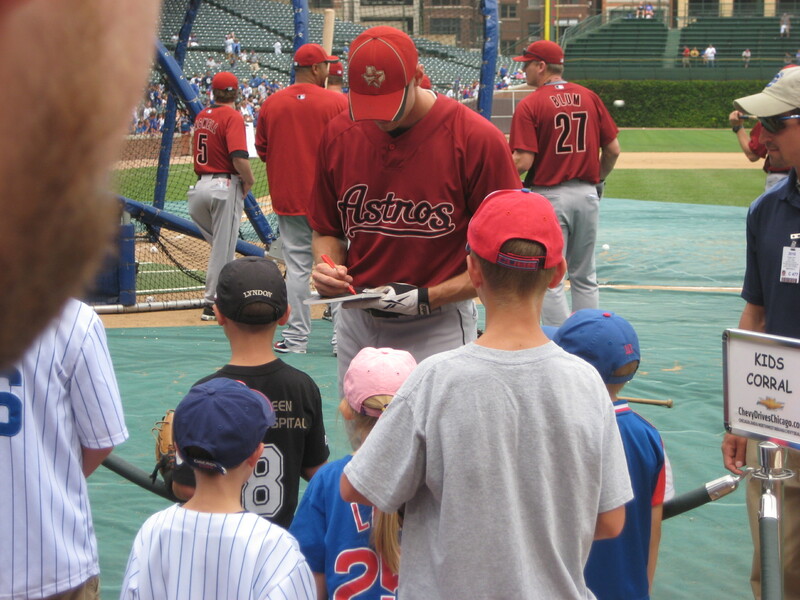 That left us the Astros to pester for autographs. Most of the kids sat there silently holding what ever they had to get signed and most of the players just kind of ignored them. It was a good ‘ol fashion stand-off. I didn’t want to seem to pushy like I was sending the kids in to get me autographs, but for christ’s sakes, you’re on the field get their attention at least! I told the kids some of the player’s names and told them to use Mr., please, and thank you. This paid off. The first victim? He had just finished in the cage and honestly looked a little aggravated. 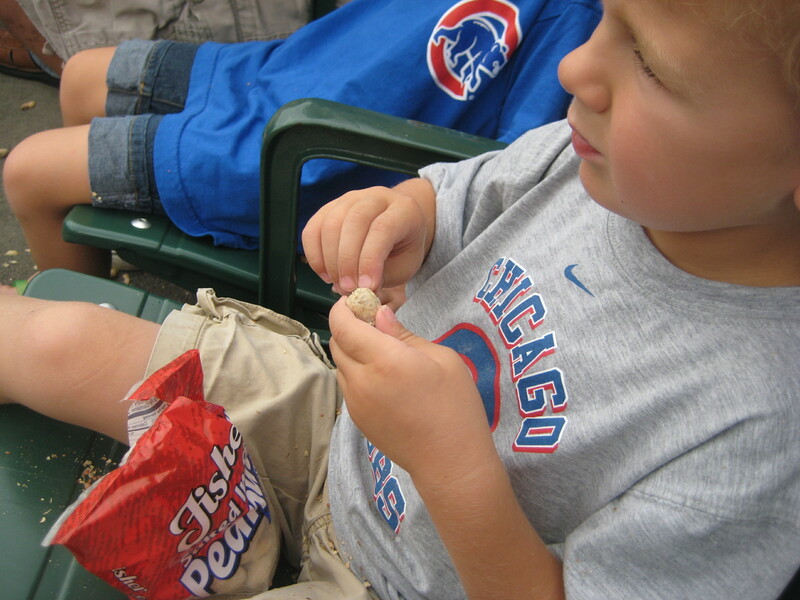 While he was preparing his bats with some extra pine tar on the on deck circle my son piped up with a “Mr. 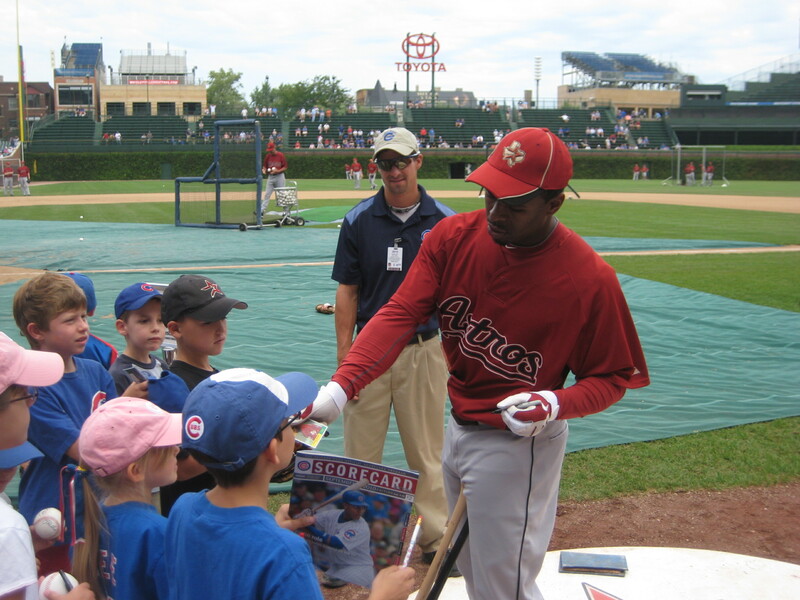 Bourn, can you please sign my baseball card?” I thought this might end badly, but he instantly smiled and said “Sure”. 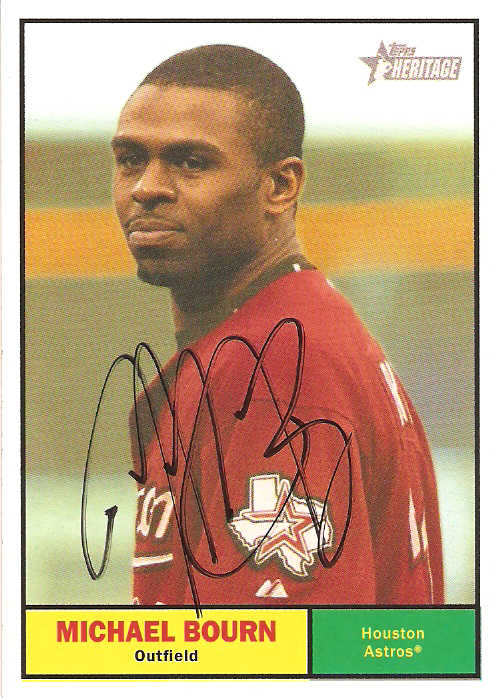 Now this is the part where he went the extra mile and made me a Michael Bourn fan. I only had one of his cards and two kids. 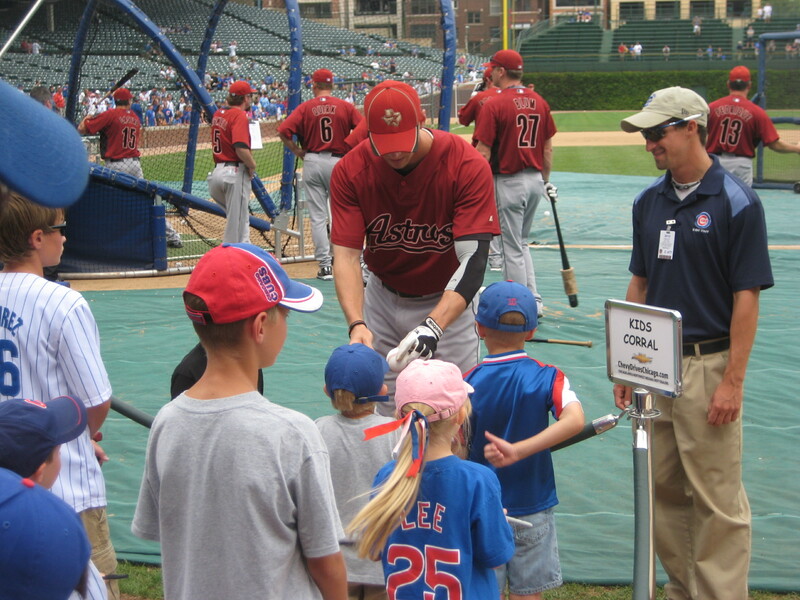 My daughter was focused on Jeff Bagwell so all she had in her hand was one of his cards. 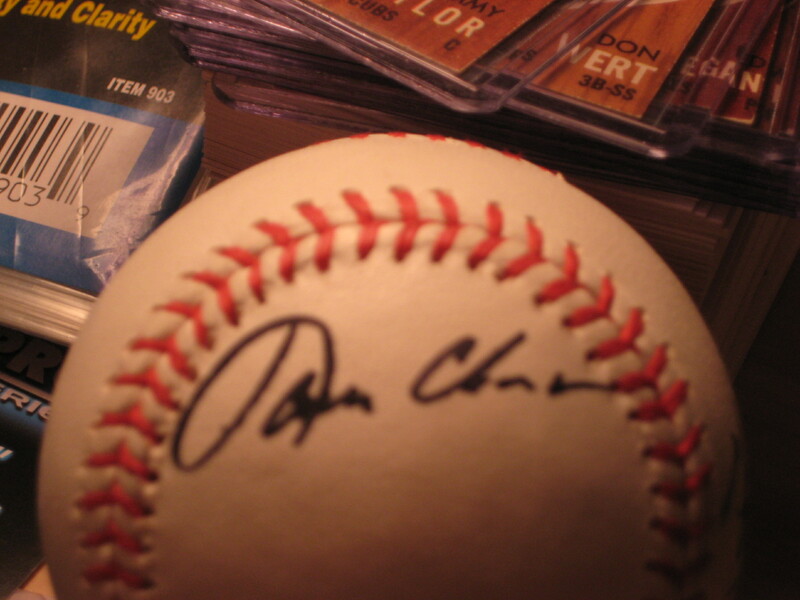 He noticed it wasn’t his card so he picked up an extra ball, signed it, and handed it to my daughter. My kids thanked him and I told them not to thank him too much, he was probably going to make a diving catch in the outfield and rob some poor Cub of a hit. He laughed and said he would be lucky just to catch one out there with the wind like it was. A big thanks goes out to Mr. Bourn. He also supplied some action with a nice clean collision at home plate where he was called out. After they got a taste for blood, it was on! The next victim? 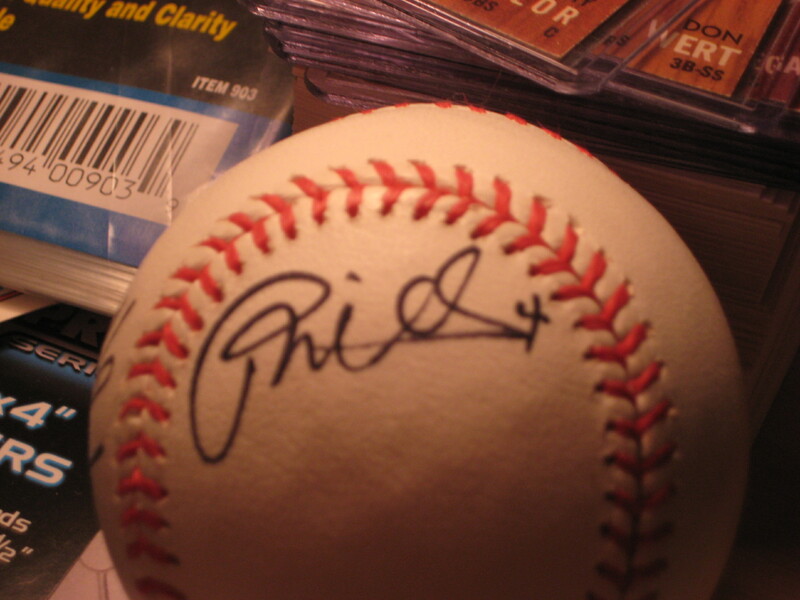 #9 Hunter Pence. By this time the ball got passed off to my son, who again was the one who got Pence’s attention. 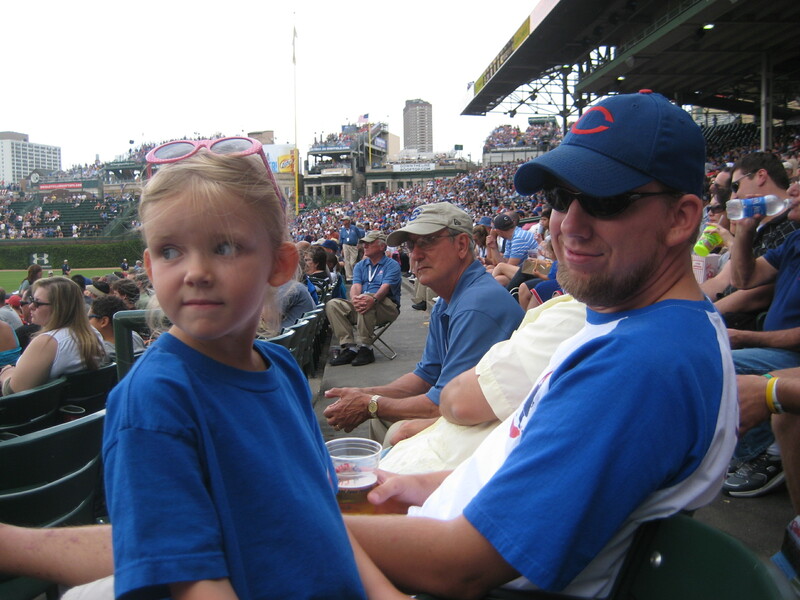 At that time my daughter still had Bagwell’s card and my Wrigley field book that I keep ticket stub’s in and have several autographs throughout the pages. She managed to get Pence’s autograph on the back cover of the book in red ink? What can I say, she needs a little more practice at this sort of thing. I have several of his cards but for some reason did not bring a single one of them with. Shoudla, woulda , coulda I guess. The last player they managed to get was Jason Michaels. 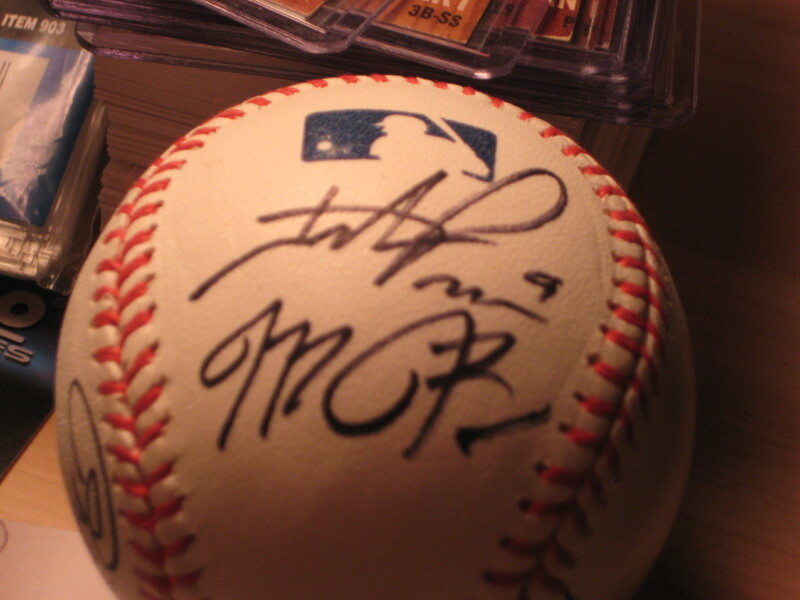 Again, my son got his attention and had him sign the ball. By this time My daughter was still unable to get Bagwells attention and it was fast approaching lunch time so she’d had enough. My son stuck around for a little bit longer and it finally looked like Bagwell was going to come over. I thought finally we’ll get this auto, but no, Wes wanted a hot dog and a beer. I’m not kidding, that’s what he turned and told me, “Dad, I’m ready for a hot dog and a beer!”. After that I thought I’d better go ahead and head for the seat before he said anymore. 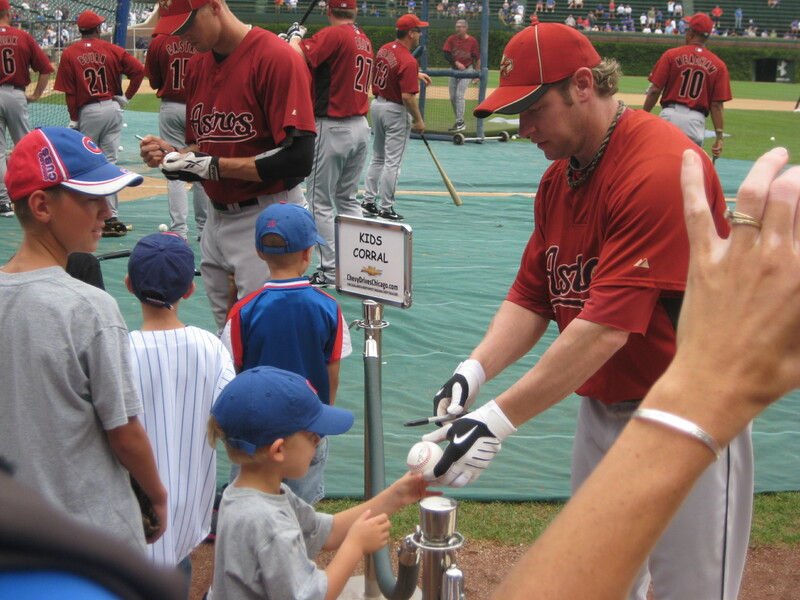 We missed out on Bagwell and Carlos Lee, but Wes noticed another player later talking and signing by the wall. 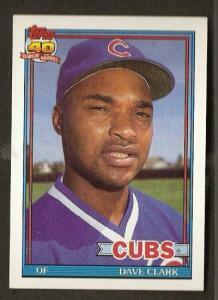 It wasn’t a player, but third base coach Dave Clark. 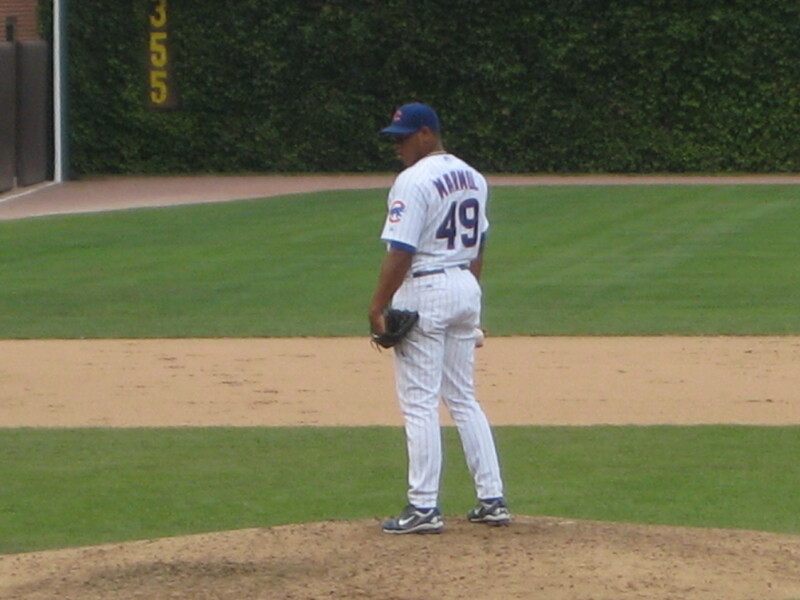 He’s a two-time former Cub and a former Astro’s interim manager. 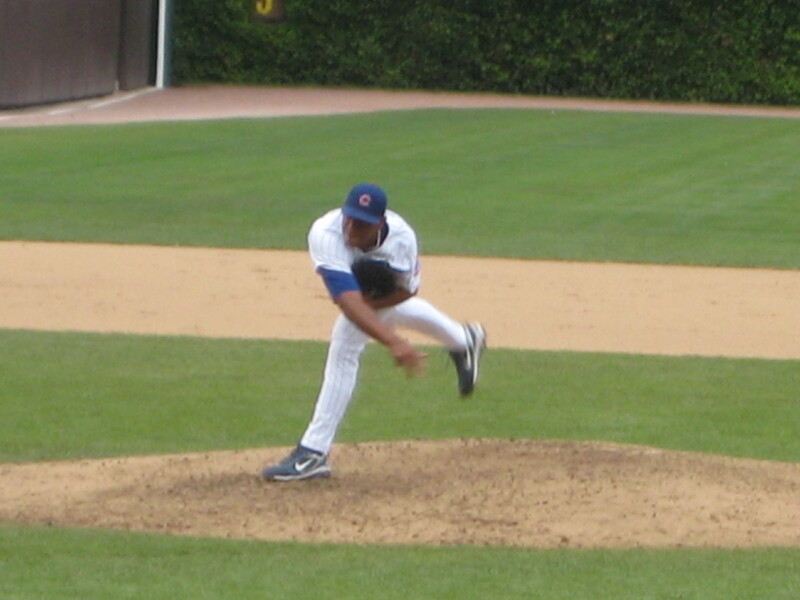 He’s also put together a respectable managing career in the minors, so who knows, 2011 Cub’s manager? My son also offered him a cookie but he respectfully declined. 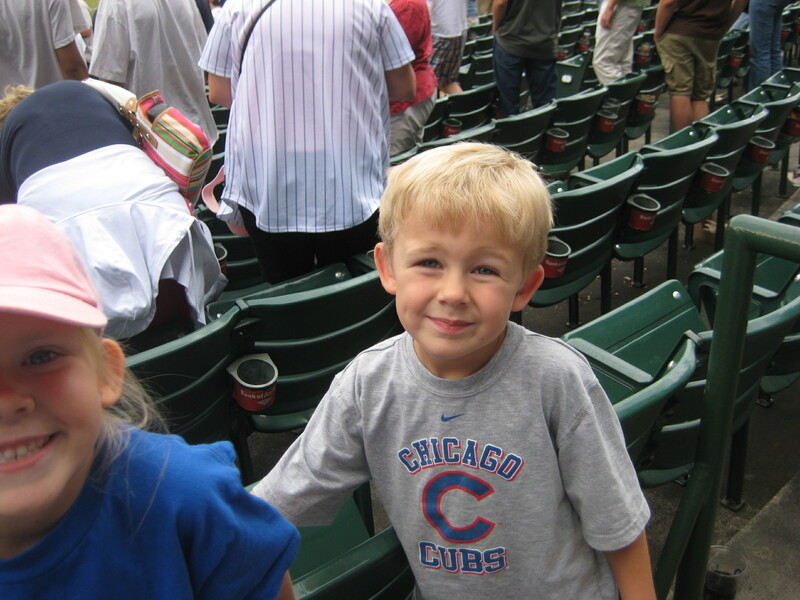 So there you have it, the kids had fun and managed to experience more in a day than I’ve managed to experience in over thirty years at Wrigley. And after this action packed day what was my son’s favorite part of the day, riding the escalator at the train station. 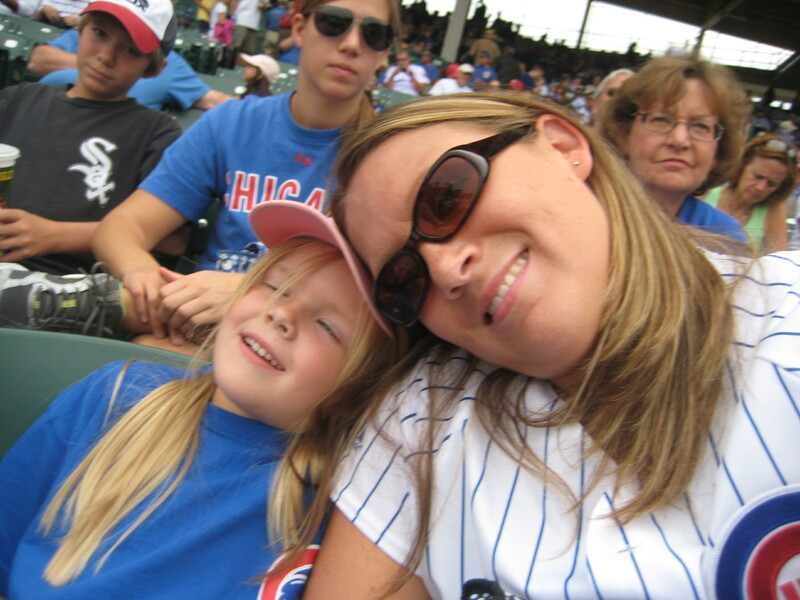 Ahhh, to be 4 years old again!